Struffoli, small balls of dough fried and then covered in honey, is the quintessential Christmas sweet of Naples and its region of Campania. Although I don’t have much of a sweet tooth, it is very dear to my heart; it was one of nonna Angelina’s signature dishes, and it never failed to make an appearance each year around the holidays. In our family they were known as ‘Nana’s honey balls’. As a child I took the name literally, and until I moved to Italy, I thought that they were my grandmother’s invention. 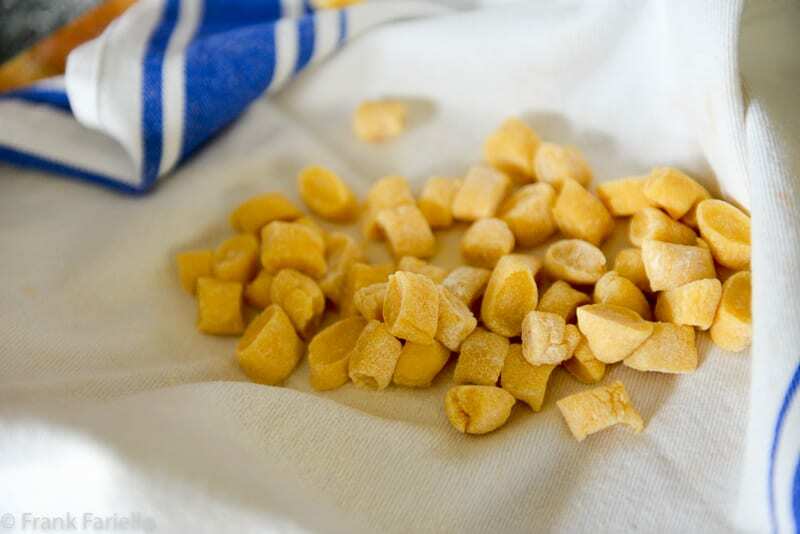 You can imagine my surprise then, when, on vacation on the Amalfi coast one year, I peered into the window of a pasticceria and saw… Nana’s honey balls! Where on earth, I thought to myself, had they gotten the recipe? Well, I soon enough learned that Nana’s secret recipe was actually no secret at all. In fact, the recipe is ancient, dating all the way back to the Greeks who settled southern Italy, founding, among other things the city of Naples or Neapolis, meaning ‘new city’ in Greek. In any event, these little babies are actually quite simple to make, but, like many old-fashioned dishes, they require a bit of time and tender loving care. You begin by making dough with the first six ingredients. This was traditionally done by making what the Italians call a fontana, or fountain of flour, in the middle of which you make a well for other ingredients, then slowly incorporating the flour into the well by hand as you beat the eggs and other liquid ingredients with a fork. These days, however, a stand mixer makes short work of this. Just put in your flour, then the other ingredients, and mix until you get a nice dough, just as if you were making pasta. Once the ingredients have formed a smooth dough, form it into a ball and wrap it in plastic wrap. Let the dough rest for a good 30 minutes or so. After the dough has rested, take a handful of it at a time and roll it into a ball. 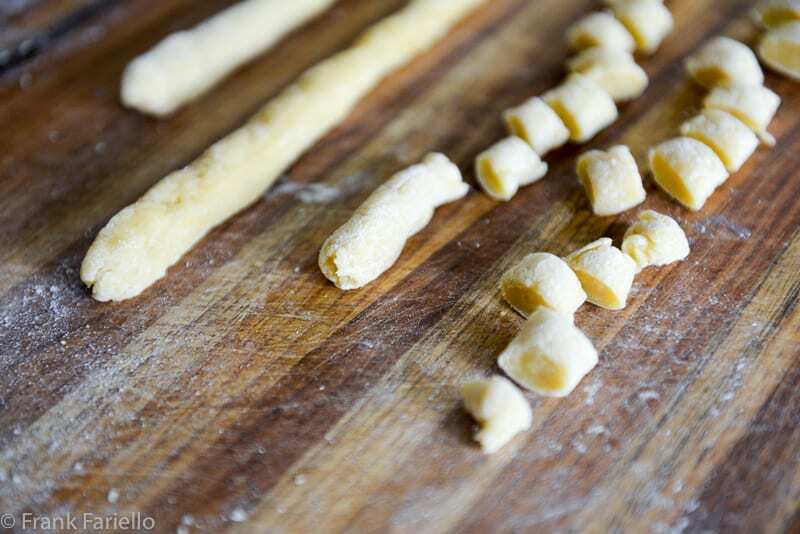 Then roll each ball out into a ‘log’ as if you were making gnocchi, pulling on the ends from time to time stretch it out thinner, until it’s about the thickness of your little finger. (If you can manage it, that it. Otherwise as close to that as you can get). Then cut the logs into short lengths, again just like you are making gnocchi, only much smaller. Place the little pieces on a floured towel as you work, making sure that they are all in a single layer so they don’t stick. Just before proceeding to the next step, you grab the ends of the towel and swish the balls around to lightly flour them. Heat the oil in a large pan. You want lots of oil so the little balls can deep fry in it. When the oil is nice and hot, but not boiling, plunge the dough balls into the oil a handful at a time. The oil will immediately bubble up vigorously. 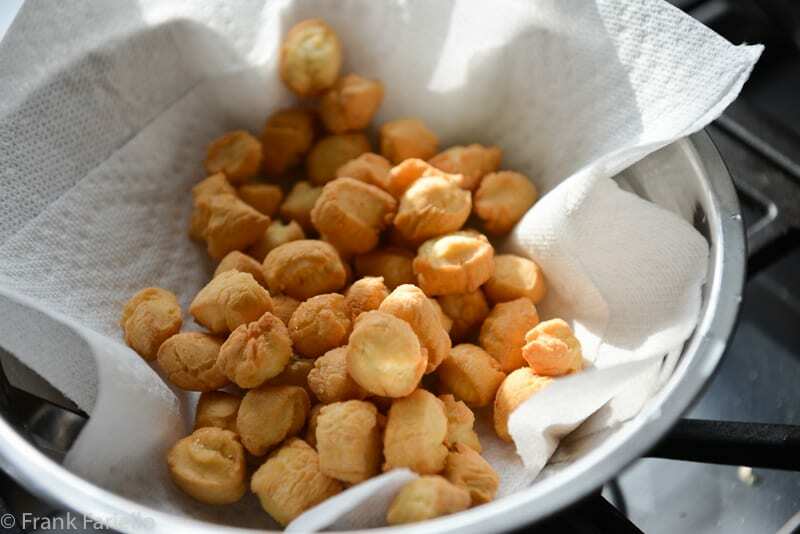 Fry the dough balls until they are lightly browned. Drain on paper towels while you proceed to the next step. Now, in an ample sauté pan or saucier or wok large enough to hold all of the dough balls, gently heat the honey until it liquifies. Add the stuffoli, stir or toss them gently to coat. Allow the struffoli to soak up the honey for a few minutes. If using the candied fruit (see Notes below) you will want to add them at this point. Remove your struffoli from the pan with a slotted spoon and arrange them on a plate. It is common to arrange them in a ciambella or ring, but you can also simply pile them high into a little ‘Mount Vesuvius’. Let me cool, then decorate with some more candied fruit if you like Then sprinkle your pile with the sprinkles. Stuffoli can be eaten immediately, but improve with age. Although it takes a few steps, the recipe is really pretty much foolproof. The only trick, the extent there is one, is to make your struffoli as small as you can manage, as that will mean more honey flavor and less chance of an undercooked middle. There are quite a few variations on the dish, although none that drastically change its character. Like many traditional recipes, the original fat for both making and frying the dough was strutto or lard, not oil. 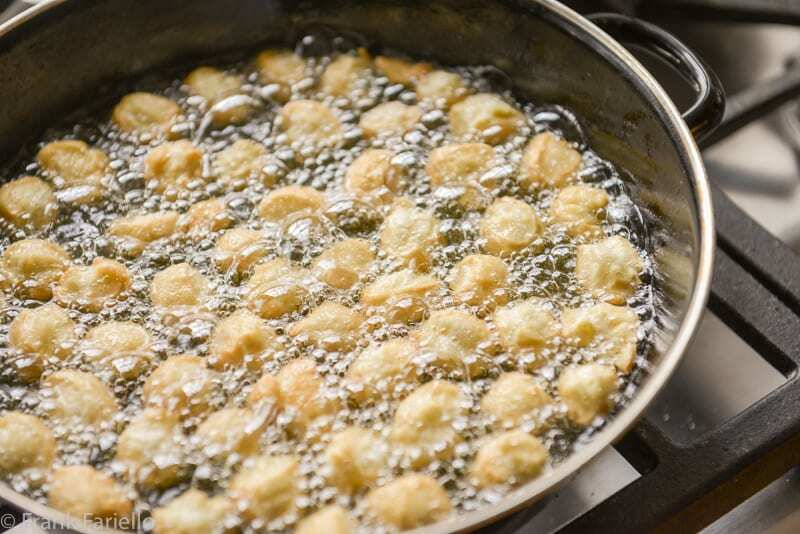 Today, it is more usual to use butter for the dough and vegetable or olive oil for frying. Not all recipes call for the liquor. And some recipes call for orange rather than lemon zest—or in the case of Jeanne Caròla Francesconi, both. Francesconi also recommends adding a spoonful of sugar to the dough. The ratio of egg to flour also varies from recipe to recipe. Here I have indicated the same ‘golden rule’ as for pasta dough: 1 egg per 100g (1 cup) of flour. But recipes may call for more or less egg, some for an extra yolk for color and richness. Some recipes omit the fat from the dough—be it butter, oil or lard—altogether, while others call for significantly more fat than indicated here. The optional pinch of baking powder lightens the honey balls considerably, but is obviously a modern permutation. Old school recipes all call for candied fruits, in particular candied orange peels. But sadly they’re not at all easy to find these days, except for cherries. (I lucked out this year!) And according to Francesconi, the really old fashioned recipe, which she dubs gli stuffoli della bisnonna, or Great-Grandmother’s Honey Balls, calls for decorating the stuffoli with peeled almonds and hazelnuts, too, as well as those sugar coated almonds that some of us of a certain age may remember were often given out as wedding favors back in the day. NB: This recipe was first posted in December 2010 and updated in December 2017. After the dough has rested, take a handful of it at a time and roll it into a ball. Then roll each ball out into a 'log' as if you were making gnocchi, pulling on the ends from time to time stretch it out thinner, until it's about the thickness of your little finger. (If you can manage it, that it. Otherwise as close to that as you can get). Then cut the logs into short lengths, again just like you are making gnocchi, only much smaller. Place the little pieces on a floured towel as you work, making sure that they are all in a single layer so they don't stick. Just before proceeding to the next step, you grab the ends of the towel and swish the balls around to lightly flour them. Remove your struffoli from the pan with a slotted spoon and arrange them on a plate. It is common to arrange them in a ciambella or ring, but you can also simply pile them high into a little 'Mount Vesuvius'. Let me cool, then decorate with some more candied fruit if you like Then sprinkle your pile with the sprinkles. Hi, this may be a dumb question but I’ve never seen these before: How do you eat them, by hand, or in a bowl with a spoon? I wasn’t sure how sticky they were. Yum! I love struffoli but I didn’t make them this year…now I’m regretting it! I’ve got a craving for struffoli! Ah, well, I was hoping for that effect, Marcellina… 😉 Now on to New Year’s! Great story about your sister Frank. Hope you had a wonderful Christmas. I love that story… Christmas was fine by us. Hope yours was nice, too. Now on to New Years! non li mangio da una vita, non ricordo nemmeno più il loro sapore, forse è meglio che ripari a questa mancanza, devono essere deliziosi ! Buona fine anno Frank ! Si si Chiara, dovresti preparli un giorno di questi, ne varrebbe la pena. Buon anno! When you posted these on Facebook, I was afraid to ask what there were; I felt I should already know! But they are new to me! And I love the story that you thought that were your Nana’s recipe! I have a few of those from my Nana, too! I wish you both a very merry Christmas and all our best for the New Year! No need to feel that way, David. Italian cookery is so varied it’s impossible to know it all! Merry Christmas to you and yours as well. Buon Natale Frank. Your little cookies brought back memories of the first year I was married. This Irish girl wanted to impress her Italian husband and made them. I only made them once because he said they weren’t his favorite. Ooops! They’re not everyone’s favorite, but for me there’s the sentiment behind them. My goodness! I have never made these, they look so fab! I will try them sooner or later. Beautiful presentation too. Buon Natale e buon anno! E Buon Natale anche a te Alida! Loved your version and the story about Nana! Wishing you and yours a very Merry Christmas dear Frank! Merry Christmas to you and yours, too, guys! Oh what a tangled web we weave… ;-_ Buon Natale, Cristina! Frank, your personal references always ring true for my childhood – yes I was rather shocked to see Struffoli in the window of our local pastry shop. Just the jolt I needed to motivate me to fry later today. Buon Natale and thank you for another year of heartwarming memories through food. I chuckled at your sister getting the extra. I do, too, even after all these years. Do they taste like mini donuts? I am intrigued and plan on making them. Not really. And their texture is rather more solid. Hard to describe until you’ve had them. But worth a try, I think! I love these, but we call it cicerchiata. I love the story about your sister! That’s so funny! My grandmother was from Florence & then moved to Naples, where my dad was born. She was an amazing cook. I used to spend weekends with her & learned so much from her. She used to make Struffoli every Christmas & I would help her. The difference with hers was that she wouldn’t just put honey in a pot to coat the Struffoli. She put a medium sized bottle of honey with 3 “spoonfuls” (which she measured with a regular tablespoon) in the deep pot & heated it until it became “syrupy”. She also added just a little lemon extract, maybe 1/4 tsp. Then she’d add the dough balls & stir to cover all of them. In a large flat dish, she’d brush just a little olive oil & pour the coated Struffoli on it. Then, cut a lemon in half & shape the mound into a wreath, using the 2 lemon halves. She’d put sprinkles & some dragees. It would harden and you could cut it in slices. Amazing! Yes, that sounds like “croccante” (or “Croccanda” in Neapolitan). It’s a classic Christmas Eve dessert. I have to admit, I’ve never made it, but I do want to one of these years! Love this dish! I’ve never made these, but used to have a friend who made them every Christmas. Good memories. Thanks. And Happy Holidays! Yep!! Those lies will catch up to you! That is so funny about your sister. Since I’m from Northern Italy and moved when I was young — I’ve never tasted them. I’d love to have some. We don’t live around an Italian community — looks like I’ll have to make them for myself. I think you’d enjoy them, Marisa. Worth a try! Buon Natale! I’ve never tried it, to be honest. But there’s no real need, as they’ll keep for several days at least. Hi Frank, plan to make your eggplant parmesan today. Can’t wait. I remember my Grandmother Mantica making Struffoli, but she did not use sprinkles. Instead, she mixed in chopped walnuts and I recall her putting the Struffoli in cupcake papers for individual servings at the holiday. She was from Reggio, Calabria but the family came down through Udine, so there were some Northern influences in her cooking, too. I miss her soooo much! Thank you so much for your great blog! My mother used to make this when we were kids. I absolutely used to love it. I’d like to surprise her one of these days. Can you please tell what flour have you used? Also, thank you thank you thank you for sharing. Regular, all purpose flour is fine. Thanks for your question, Nina! I’m sure they have a lot of names, depending on culture and location. Almost forgot heres the link to photo http://instagram.com/p/Tkb1ffyxeV/ I need to make more dough next time. It was a bit sparse. I am planning to make this do U know if u can make balls ahead and fry the next day? Maybe refrigerate or leave out overnight? Sure, Lisa, no problem! Just let the dough come back to room temp before frying. You can also just make and fry them the day before—it gives the honey some time to penetrate. Hi I wanted to know if the balls can be stored in fridge or room tempature BEFORE you fry them or should they be fried right away? I wanted to make balls first and then fry them the next day to save on time. They look great, Frank. Have a wonderful holiday. Thanks for writing, Steve! I know what you mean about the frying. I made a batch today for the big event this weekend—always manage to splash some hot oil on my hands… but it's worth it! hey steve z. (brother)….We are making our second batch tonight…the first didn't seem to be enough..so we doubled it and are going for round two. Update to previous posting (two posts above under “anonymous”) I brought a batch of Struffoli to my kid's school for his class project. They were not a big hit…just as I remembered from my childhood. The kids go for sweeter things while the adults (and the teacher) loved them. The remainder of the batch went home with me and Monica and I gobbled them up. I might have to make another batch before Christmas! I make a batch every year at Christmas and give them as gifts to friends and family. This year I added equal parts vanilla and almond extract and anisette. I think this is my favorite combination yet. Also, I had honey my neighbor Jim (a bee keeper), had given me as a gift and it was so much better than the commercial stuff. It is a lot of work as I make enough to fill my Kitchen Aid mixing bowl and I refrigerate and make it at my convenience. You can also freeze the balls after you fry them and use them later for another occasion. 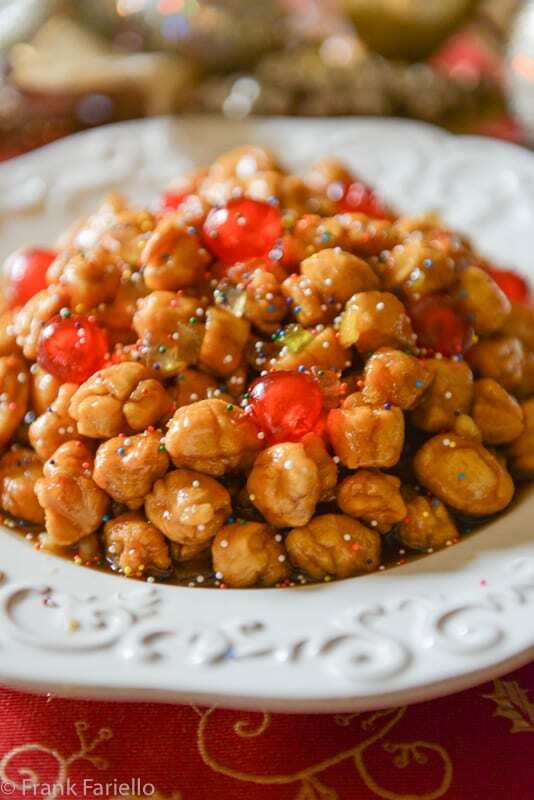 As a kid my family always cooked together at holidays and some of my best memories are making Struffoli at Christmas. Thanks for sharing! My son had to “interview” me for a school project about “your greatest Christmas memories from childhood”. I immediately thought of the great food my mother would make every year. I also remember my father did the frying of the struffoli because the hot oil could be dangerous and he would handle that! He did the same with the zeppole as well! What wonderful memories indeed…the toys get broken, you outgrow the bike, but the food lives on forever! Bravo! Glad to be of help, Anonymous! Do try them some time, they're not all that hard to make. My uncle Carmine made these every year at Christmas and I've been craving them. I'm so glad I came across your recipe. The photo brought me back to my childhood and the my mouth watered just remembering uncle Carmine's wonderful treats. Thank you for posting. Well Its Christmas time again and I will thinking about my Grandmother and what did I find? Your recipe for Struffoli! I am going to make them this year for my family for the first time. Hope this works. I will take my time and make them small. These look absolutely amazing, Frank! I'll bet my grandchildren will love them, as I'm going to make them soon. I loved these when I was a kid. Haven't had them for a while. This sounds easy and I will give it a try. Wonderful holiday treat. They look delicious. @Claudia, Mine need to be even smaller to match the ones that Angelina made. And, as my family pointed out, more perfectly round! But no matter–practice makes perfect, I suppose. @Arpita: There is a very similar dish in Sicily, or so I hear, that is called perceddrhuzzi, which is made with an eggless dough made from flour (1/2 all purpose, 1/2 semolina) mixed with olive oil, orange juice and a bit of anisette or sambuca. You also add a bit of yeast for 'lift'. Let it rest about an hour and then proceed just as in this recipe. The decorations can included, in addition to honey and sprinkles, and/or candied fruits, pine nuts and almonds. Thanks, everybody, for your kind comments, as always. Yes, indeed, it is a small world! No surprise, really, that these little honey balls or similar treats can be found all over the Mediterranean basin. You had me at “fried dough”! These look so amazing! Great story about your sister! It's a long story that I wont' bore you with but almost the same thing happened to my husband and cornbread stuffing… Merry Christmas! Great 'How To' shots! I just tried strufoli for the first time while shooting some pictures for the Holiday issue of the magazine I work for. Strufoli and Ribons! Grandma Teresa made them so wonderfully tiny. I was going to post this – but yours are smaller. Mine are too big. Again. Maybe I'll just send my readers to you! Nothing conjures up childhood like struffoli. My absolute favorite from my childhood. Enjoy! Almost like Turkish sweet .. thx for sharing . I looked at the top photo and thought, 'Oh wow, we eat these in Turkey.' A lot of the patisseries sell them. Then I read what you'd written about the recipe being an ancient one from Greece. That explains a few things. The world of food is a strange one isn't it?